Ideal for developing companies, this property provides either shared open space or self-contained suites all within a stately Grade II listed brick building. A short distance from Brentford mainline station, the area is well connected with central London and served by a host of retail outlets and eateries. Local amenities are great and are further enhanced by the ability to explore all Central London has to offer. Units of various sizes are available to let in this small centre suitable for a range of businesses. Car parking, access to meeting rooms and showers are provided and the offices are located close to Brentford station and also near to the relaxing green spaces of Gunnersbury Park and Kew Gardens. 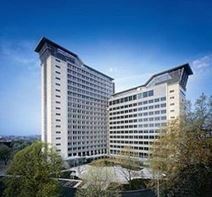 This iconic workspace is located on the prestigious 'Golden Mile' and offers great transport links to London and beyond. Amenities at the space include meeting and conference rooms and plenty of breakout spaces. With onsite parking facilities, raised access floors and competitive prices on your flexible terms, the space provides the perfect modern business environment. Ideally located on Great West Road, the space is accessed easily from London and beyond. With plenty of public transport routes running directly adjacent to the centre, you'll find yourself with an easy daily commute. 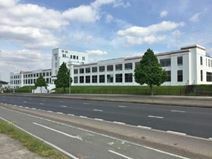 This impressive building with a blue-tinted facade overlooking the Great West Road to the front and Gunnersbury Park to the rear has fully serviced office space available now. With both private and coworking desks, this centre is perfect for all types of businesses. Although in the suburbs, this centre is well connected to Central London with a bus route to Hammersmith and Kew Bridge station just ten-minutes away on foot. This business centre is conveniently located close to Brentford rail station and the amenities of the high street and has a cutting-edge modern design and full servicing. Facilities such as car parking, showers and secretarial services are at tenants’ disposal and the building is equipped with superb technology and quality contemporary furnishings. Enjoying exceptional panoramic views of the capital, these contemporary serviced offices in Brentford are accessed via a luxurious shared reception area and provide residents with 24 hour security, onsite parking, meeting and conference rooms, and restaurant and fitness centre.